Brown ‘No Calorie’ Noodles – are they different? 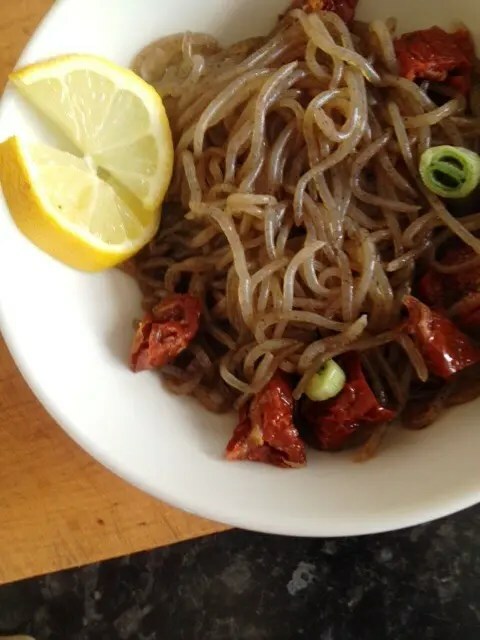 The New Food Challenge was partly sparked by all the interesting foods I saw at the Natural and Organic Product Show a few weeks ago so expect a few posts on things I saw there; like today’s on Brown Shirataki noodles. I’ve been talking about no-calorie Shirataki noodles for a while but at the show a company called Yutaka were showcasing their brown version. What was the difference I wondered? It seems, looking at the ingredients it’s the addition of seaweed powder as everything else seems to be the same as the white ones. Also checking the label I note they also contain one more calorie per 100gm that the white ones – (quelle horreur – or whatever the Japanese equivalent is) but as this takes them up to a whopping 6 calories – and 2.8g of carbohydrates – per 100gm. I think I can live with it. So, the next question was, do they taste any different? Yes is the answer. I tried a spoonful alone (even though shirataki don’t normally really taste of much solo, they pick up flavour via whatever you have them with). The seaweed powder does give them a taste of their own; it’s almost kind of meaty. They also seemed less slimy than the white noodles. To serve with them I decided on a strange mix of tuna mayonnaise, spring onion and sundried tomatoes – don’t ask me why, I was just really craving tuna mayo so I figured I’d try it. I wasn’t sure how I was going to marry the topping with the need for something to flavour the noodles and was ferreting in the cupboards for something to use as a sauce when I came across the Ponzu sauce I bought to make Cameron Diaz’s breakfast. It’s a mix of of soy and citrus, at which point I decided I’d also rescue the slightly sad looking lemon in the fruit bowl and give it a job in life. I cooked the noodles, added a dash of Ponzu and the juice of half a lemon, left them soak for a bit and voila. Sadly, no, there’s no picture of version with tuna added here. No matter how I angled the bowl it looked like something that should be on one of those ‘Pinterest Fail’ sites. In terms of taste though it was really good – if you haven’t tried lemon with the noodles before I’d absolutely recommend it. If you weren’t that impressed with white shirataki I’d also suggest trying brown and seeing if you get on with those better too. You’ll find a list of stockists via the Yutaka website. If you’ve more questions about Shirataki though check out this post by thehumanyoyo which has, literally, thought of everything. Oh, and I also now have a theme tune for the challenge. I really wasn’t feeling today’s run but a song came on my shuffle that got me through it and, it, funnily enough, pretty much summed up the next 28 days of my life. It was Eat, Sleep, Rave, Repeat (the Calvin Harris Remix) – I figure swap Rave for Run and you’ve got my world for a bit!